This lot features a vintage 1963 "The Comedy of Terrors" original movie theater poster. This poster remains in nice condition as it has been stored flat and has not been folded only rolled. 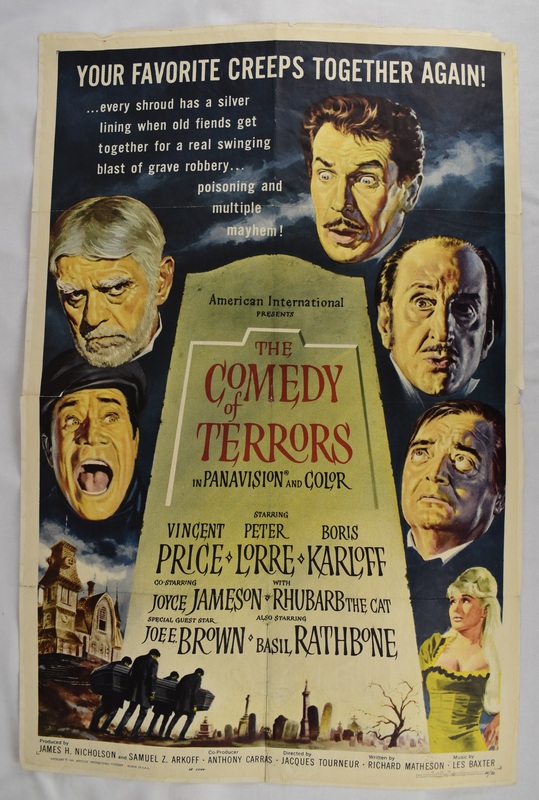 The Comedy of Terrors is an American International Pictures horror comedy film directed by Jacques Tourneur and starring Vincent Price, Peter Lorre, Basil Rathbone, Boris Karloff, and (in a cameo) Joe E. Brown in his final film appearance. It is a blend of comedy and horror which features several cast members from Tales of Terror, made by AIP the year before.